North Korea has released CCTV footage of an American student allegedly removing a propaganda banner from a staff-only area in the Yanggakdo International Hotel in Pyongyang where he was staying over New Year’s Day. Conditions are horrific. People are worked for 14, 15 or 16 hours every day with just a handful of corn to live on. American undergrad Otto Warmbier got 15 years imprisonment and hard labor for the crime, the isolated and communist state said earlier this week. “Let’s arm ourselves strongly with Kim Jong-il patriotism,” the banner read, according to news reports. They are intentionally starved and worked to death. North Korea said the footage was shot on New Year’s Day. A member of Warmbier’s flight said his tourist group had been drinking vodka into the early morning hours, according to The Independent. The 21-year-old University of Virginia student was stopped at the airport and detained by guards. He was later presented to the press, where he cried and apologized. On Wednesday, the country’s Supreme Court convicted him of “crimes against the state” before sentencing him to 15 years of hard labor. “In the course of the inquiry, the accused confessed to the serious offense against [North Korea] he had committed, pursuant to the U.S. government’s hostile policy toward it, in a bid to impair the unity of its people after entering it as a tourist,” the state-run KCNA said, according to the Washington Post. Torture is common, there is no medical aid and the sanitation is horrible. 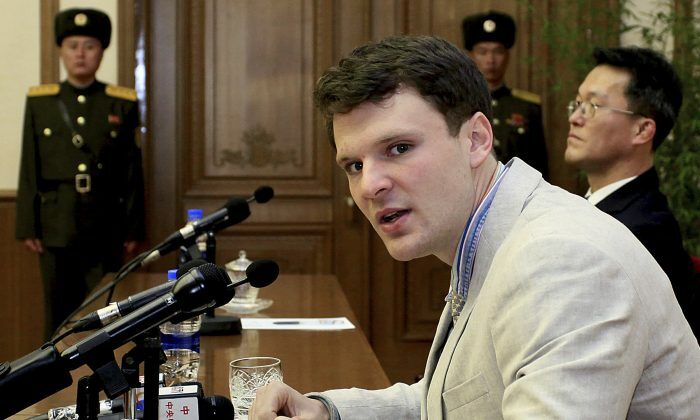 The White House and U.S. State Department have called on the North Korean government to pardon and release the student, saying the 15-year sentence is too harsh. It added that Pyongyang is using Warmbier is a political pawn and is seeking leverage over the U.S. Meanwhile, tensions on the Korean peninsula have increased after the North conducted a nuclear test and fired rockets into the ocean last month. North Korea has used labor camps since the 1950s. Those who survive the ordeal have tales of horror, saying many are killed off by starvation and forced labor. The United Nations estimates that the Stalinist state holds between 80,000 and 120,000 prisoners in the camps. Hyuk Kim, who was arrested trying to sneak out of the country, said he subsisted at a North Korean labor camp by eating rats. “If you tried to cook the rats, the guards would smell the meat or fire, catch you and beat you mercilessly,” the 33-year-old recalled after escaping.